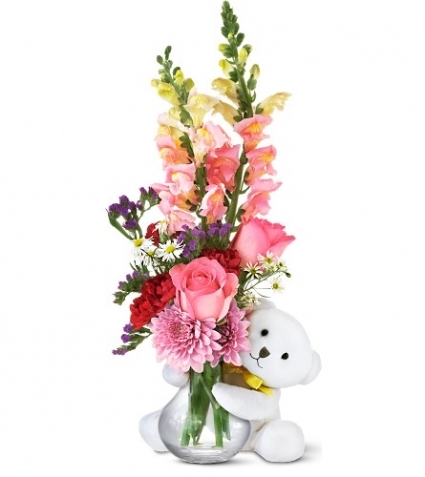 Send this adorable little bear with enchanting flowers, and someone special will think you're just as sweet as can be. Carnations, Miniature, Fuchsia, Chrysanthemums, Spray, Cushion, Lavender, Monte Cassino Asters, Small, White, Roses, Cm, Pink, Snapdragons, Pink, Statice, Sinuata, Purple, Telefloras Bear Hug Bear & Vase. Each Roses, Cm, Yellow, Chrysanthemums, Daisy Spray, White, Chrysanthemums, Daisy Spray, Yellow, Oregonia, Block Floral Foam, Each Be Happy Mug, Teleflora, J, ( H X W (Including Handle) Opening). Perfect for make someone smile week! There are probably a million reasons this is such a popular bouquet. Of course, there are probably just as many reasons to send this cheerful arrangement. 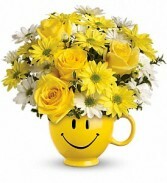 Full of happy flowers, this ceramic happy face mug will bring smiles for years to come. Especially when filled with that first cup of morning coffee or cocoa!